Holder Emily Hodge did not defend her title. "Miss Parr undoubtably owed her victory to her brilliant volleying and could no doubt teach many of the gentlement competitors something in this respect. Goldsmith had three points to equalise at 10-10 but through over confidence lost the game and match." Last edited by Rollo; Dec 14th, 2018 at 03:28 AM. MX: Mabel Grant/Mr Davis d Mrs Murell/Mr Eaton ???? Mon 11th Apr. Mabel Grant left for Port Elizabeth in the “Hawarden Castle”. Note that Easter, the traditional date for this event, was on April 17. Last edited by Rollo; Oct 22nd, 2015 at 01:42 PM. FI: Mabel Shaw d E Mackenzie ???? FI: Ellen Mayne/Ben Green d. Miss Dransfield/Stewart Tiley ???? Miss Dransfield had won the women’s doubles title in 1891 with Zilla Scott. Zilla was not here to defend. At a time when there was no seeding, Louisa Martin met Lottie Dod well before the final. This was probably Lottie Dod's only loss in singles after 1886. It is not clear which of her two brothers Lottie Dod played the mixed event with, though it was probably Anthony, not William. Herbert Chip's book Lawn Tennis Recollections states, 'Several of the decisions in that match were curious, to say the least. But that was not Miss Martin's fault" (p 118). Was there some favorable line-calling for the local Miss Martin? From "Pastime", June 1, 1892: "But the greatest surprise of all was that in the match between Louisa Martin and Lottie Dod in the ladies’ singles – a match which practically decided the question as to which country should claim the championship so far as this meeting was concerned. “Scarcely anyone expected Miss Martin to win, but win she did. She started with great dash and decision, the court – somewhat slow and heavy from thundershowers – appearing to suit her admirably, and proving just as unsuitable to her opponent’s style of play. The consequence was that Miss Dod had no time to get into her stroke, and the set was quickly won by Miss Martin by 6-2. “Miss Dod improved in the second set, and showed something like her true form. She made the match set-all, and when she stood at 2-1 in the third set it was thought she would once more prove too strong for Miss Martin, who was showing signs of exhaustion, for she had not spared herself. A heavy thundershower now broke over the ground, and play was perforce suspended for about twenty minutes. “This rest proved of great service to Miss Martin, who on resuming played with almost as much energy as in the opening set. A bad decision in the seventh game was not without its effect on Miss Dod’s play. By this piece of ill-luck the games were called 4-3 in favour of Miss Martin, whereas the score should have gone back to deuce. Four-all and five-all were then called, but Miss Martin took the necessary two games and the match by 2 sets to 1, a result which, it may be truly said, caused considerable surprise, this being the first occasion for several years on which the English lady champion has known defeat. Last edited by Rollo; Oct 22nd, 2015 at 01:53 PM. Only two players – sisters – entered the main women’s singles event at this tournament this year. Last edited by Rollo; Oct 22nd, 2015 at 01:56 PM. It is unclear why holder Florence Stanuell did not defend her singles title, as she was in the doubles draws. FI: May Jacks d. Violet Pinckney ???? This was another change of venue for the Yorkshire Association Tournament usually held in Ilkley, but held in Headingley in 1891. Last edited by Rollo; Oct 22nd, 2015 at 02:13 PM. Mrs GA Draffen= Beatrice (nee Wood) Draffen. SF: d Miss MacLaren ???? Miss MacLaren was the Maritime Provinces champion. Miss Budett and Miss Homans defaulted in the first round. There were no women’s doubles events at this tournament this year. Results copied from the New York Sun, which reported on the poor court conditions, which were described as "soft." Florence L Stroud played for the Ariel Club. Last edited by Rollo; Jul 17th, 2014 at 05:00 PM. * The women’s singles event was "handicap" only. 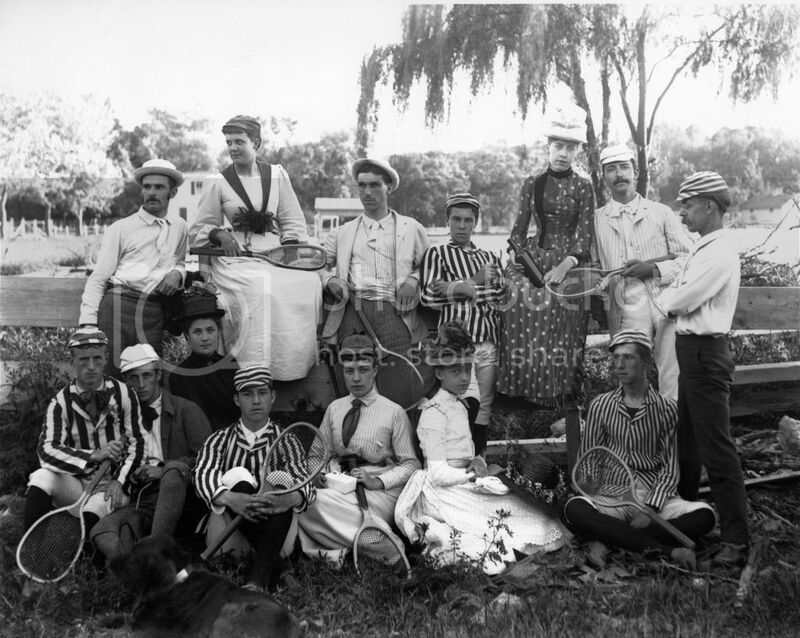 * The women's singles event was handicap only at this tournament in 1892. Inaugurated in 1890, this tournament was not held in 1891. Last edited by Rollo; Oct 22nd, 2015 at 02:17 PM. Holder Miss Lee of New South Wales does not defend her title. DF: Mrs Reader/Voules d. ?? Could Miss Jackson= Helen Jackson? Last edited by Rollo; Oct 22nd, 2015 at 02:31 PM. Nunneley would later go on to great fame in New Zealand, winning that championship numerous times. In 1892, the girls’ and boys’ singles events at this tournament, open to players aged under 17, were won by Ellen Cressy and Hugh Lawrence Doherty respectively. FI: Miss Boyd d. I. Foster ???? DF: Charlotte Cooper/E Cooper and Elsie Pinckney/Violet Pinckney divided the prizes. The final matches at this tournament could not be played due to heavy rain. Both pairs of finalists were sisters. * This year the women’s singles event was "handicap" only at this tournament. Note: There was no Challenge Round at this tournament in the years circa 1892-99. It was reinstated thereafter. Last edited by Rollo; Sep 6th, 2016 at 02:27 AM. The runners-up in the women's doubles event were twin sisters. Julia Shackle did not play much competitive tennis. QF: Bryan d. E Pinckney ???? At 32 this is the biggest draw we know of for 1892. * At this point in time the women’s singles and the men’s doubles events at this tournament were played later in the calendar than the men’s singles. Holder May Arbuthnot did not defend her title. The final appears to have been a best-of-five-sets match. Last edited by Rollo; May 3rd, 2016 at 10:42 PM. Venue: Staten Island Ladies' Club, Staten Island Cricket Club. QF: Collard/Ferris d. Stroud/Paret ???? PR = Preliminary round. In this era it was common to use "Preliminary Round" for what would today be termed the first round. Miss S Homans=Sarah Homans. She also was know by the name Sally (or Sallie). Last edited by Rollo; Mar 18th, 2018 at 03:42 AM. Holder Mabel Grant did not defend her title. Mixed doubles was handicap only. Usually this is considered the 1892/93 Championships. Play was much delayed by rain. The semifinal between Rees and Douslin drew the biggest and most appreciative crowd of the week. The Otago Witness declaring that both women hit "with masculine power". Rees hard hitting, especially down the line off her backhand, trumped Douslin's steadier play. "Miss Rees remarkable hard drives will not soon be forgotten by her opponents, and they decidedly won her the championship, for there were other departments in which she was manifestly weak." This was from The Otago Witness, which also reported on the poor weather, suggesting a later date as apossible remedy. the women's doubles was won by two local women from the Otago Club by default and the singles vastly reduced in scope. Miss L Mackerras and Ruth Orbell are both from Dunedin. Last edited by Rollo; May 3rd, 2016 at 10:37 PM. FI: mrs Sydney Smith d. miss Faulkner ?? MX: miss Gillespie/Matthews d. miss Osborne/Moreton ?? FI: miss Fergie d. mrs Reader ?? DF: Reader/miss Voules d. ? ?